Her creative revolution comes with value-laden messages. Despite being born and raised in Riyadh, Fatani considers herself a global citizen and gathers inspiration from her accomplished ancestors who exhibited philosophies akin to her own. With pioneers in fields such as poetry, education, architecture, finance and many others, her heritage is a source of motivation. Early in life she developed what she refers to as a fixation to study art. However, aside from some ceramics courses, Fatani’s career veered away from her fascination. After years of working for prominent Riyadh hospitals, heading the HR and Training Development Department at the World Trade Centre Riyadh (while studying Business Administration Systems), her creativity was finally given a release. In 2008, Fatani, her husband and their two daughters moved to Vancouver, where “the magic happened.” She enrolled in the Emily Carr University of Arts and Design and pursued her passion for creativity. Upon graduating in 2011, Fatani completed diplomas in Fine Art Techniques, Industrial Design and Architecture Design. Between 2011 and 2013, armed with new credentials, she embarked on establishing groups with the purpose of “creating positive social change focused on creativity,” an example being Project Hawas. What’s more, she taught at establishments like L’Art Pur Gallery and Dar Al’Uloum University in Riyadh. Fatani also earned official certification as an accredited trainer in arts and crafts by the SB Arts Academy. Fatani immerses herself in creativity, whether by producing commissioned pieces, group or solo exhibitions in Saudi Arabia, Bahrain, and Canada, or participating in panels and discussions. She explores many mediums such as sketching, calligraphy, painting, street art, installations, ceramics, mixed media, metal weaving, silversmithing, felt making, and carving. In each, she’s found a highpoint. For example, she finds a healing element in sculpting and ceramics. In painting, she has a way to create “visual memoirs, thoughts and secrets between the layers, lines and textures.” Plus she says charcoal is therapeutic and when mixed with water “gives a sense of permanence and strength.” Mixed media reminds her of a “free-flow playground” with its fusion of all mediums. However, Fatani’s heart goes to architectural installations. In this interview, the artist opens up about inspiration, the direction of her art, her projects and studio and her observations on Saudi art. When did you start expressing yourself artistically? Was there a defining moment? I’ve always been an artist, a designer and a crafts person; I just didn’t have the know-how to be a professional. So, prior to my professional creative education, I enjoyed experimenting with different creative paths. I never stopped, it was and still is a passion that keeps me moving forward. Painting and drawing were always present in my life. The first art exhibition I participated in was at the age of 30, when I exhibited over 30 pieces at Lahth Gallery in 2000. In 2004 I had one at the Arch Gallery. Sofana Alomair commissioned a super funky painting for her coffee shop at the Ladies Kingdom Mall. It’s called “Retro Dancer” and this initiated a series of commissioned works. What inspires you? Could you also explain your process when creating a piece? Life is my inspiration. It starts with a haunting thought, an experience I’m going through, or a phrase resonating in my heart. It is personal and almost always connects with viewers. Usually, social aspects of life, relationships, emotions and spontaneous states of mind inspire me for each project. When it comes to art pieces, I prefer complete isolation with headphones on; a song keeps me in the same mood and helps me focus. That’s when I explode on canvas. With design, I think of technicalities, aesthetics, as well as compelling messages. A large sketching pad along with my charcoal is where the process begins, followed by a brainstorming session. You have a hand in several mediums. Which expresses your voice most? Installations have always been my favourite, as it’s considered one of the highest forms of fine art. It combines art and design while being experimental and influential. Installations may contain many elements of design (space, sound, audio, graphics, photography, videos and so on); it takes people through the minds of artists. Project Hawas installations, “Sgalah” and “ThaaT,” exemplify this. I’m a proud founder of this collaborative group and we’ve achieved greatness together. The projects were based on the process of our journeys as individuals exploring our obsessions with creativity. Cooperating and focusing on one goal has given us a louder voice, stronger visual expression and sense of accomplishment. People were intellectually provoked and the outcome was magnificent. They were surprised to see Saudi-based artists from all age groups (16-50) collaborating on a huge and wonderful structure. The first of its kind, it is based on originality and sophisticated expertise from diverse participants in a professional atmosphere. Proudly, I can say that we opened minds and helped establish an artistic platform based on teamwork and experimentation. What motivated the establishment of Studio Lucha? Also, please elaborate on the classes or workshops offered. Studio Lucha was my mother’s home. It’s where I created a sanctuary and healed after she passed away. It’s my creative escape and where I host creative gatherings. I decided to execute the concept of the open studio for like-minded, creative women to socialise and work on their projects or group projects. Also, the studio provides guidance through peer support. Most importantly, I wanted to create an inspirational space that is homey and comfortable. It offers services that include (but not limited to) wall murals, sculptures, paintings, urban fine art products and customised creative workshops. The workshops include, Basics of Drawing and Sketching, Clay Building, Acrylic Painting, Installations, Eco Art, in addition to many more. We’ve presented opportunities for certified and accredited trainers to join us in providing more workshops in our humble space. 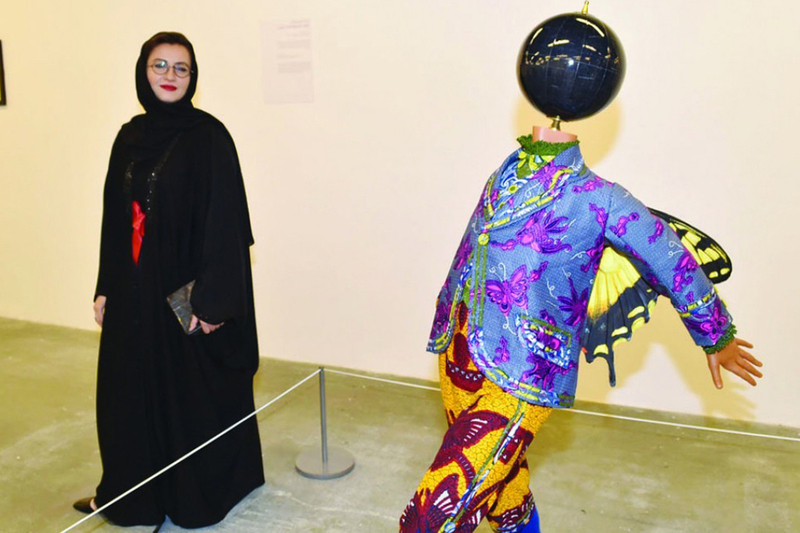 What is your opinion on the Saudi art scene? I’m quite impressed by Saudi art. It has come a long way and is gradually advancing. We’re not there yet, but we’re certainly on the right track. There are great talents that are not fortunate enough to be known publicly, due to lack of support and old societal views. We still lack high-level creative education; this creates self-esteem related issues and unprepared future creative professionals. However, there is so much to focus on. Ultimately, the best project you can work on is yourself. Having passion for creativity and courage to defeat the status quo is challenging, especially in a society that considers the creative field a mere hobby. The governmental system has been looking into the creative industry as a valuable asset. If you look at artists who’ve made it, know that they’ve worked hard and deserve every bit of recognition. Our future depends on supporting each other. We all have a unified goal, which is to make our world a better one for future generations. I call myself Talent Hunter, I search for talent and find ways for us to collaborate. Building creative communities is challenging but worthwhile. To join Dalia Fatani’s creative community, be sure to follow her on Instagram: @dselectived for her portfolio, @StudioLucha for a glimpse into her creative escape and @ProjectHawas for updates on the vibrant collaborative team.